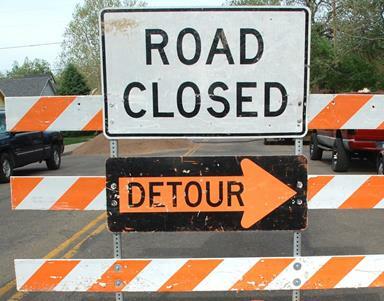 Full road closure on 30th Street East, from Avenue R-12 to Avenue S.
A detour on 27th Street East and 35th Street East will be in effect until Jan. 31 for storm drain installation. Follow detours and expect delays. Thursday, Jan. 31. , from 1 p.m. to 11 p.m., Lancaster Blvd. closed between Ehrlich Avenue and Fern Avenue. 7:30 a.m. to 3 p.m. daily. Intersection of Lancaster Blvd. and Ehrlich Avenue closed. This intersection will be closed to street traffic daily until Jan. 31. Lancaster will join the worldwide crosswalk art movement by installing a series of murals at this intersection by The Art of Chase. Residents are encouraged to come out to see the artist in action, from 8 a.m. to 1 p.m. each day, until the installation is complete [Jan. 31]. Closures are due to sidewalk, curb, and gutter repairs related to Public Work Construction Project PWCP 18-006. Intermittent lane closures on 5th Street East, between Avenue H-8 and Avenue J. Closures are due to sidewalk and street improvements related to Public Works Construction Project 17-009. 1 comment for "This week’s road construction updates for Palmdale, Lancaster"
What is being created at the intersection of 15th St East & Lancaster Bl? A Turnaround?